How do you go about getting into the Bible with your group? The Bible is packed full of fantastic stories that we can share with our children and young people, but the challenge is getting the story and its message across in an engaging and memorable way. We will often find ourselves opening up the bible and just reading the story aloud. The message is still immensely powerful, but will we keep the children and young people engaged if we just do the same thing week in, week out? It is often challenging to work with a large number of children, each with their own personality, background, learning style and attention span! Some are eager to learn but easily distracted; others are reluctant to be there or merely indifferent to the story. However, you want to help them get into the story for themselves and enter into its meaning. Most of all, you want to give them the space, time and tools to hear God speaking to them through the story. Gather together a number of items related to the Bible story, and put the items into separate bags, numbering the bags 1 to 5 (if you have 5 items). Starting with bag 1 ask for a volunteer to come up and see ‘What’s in the Bag’. They could just pull the item out, or if appropriate could try and guess what is inside by feeling the contents. Pulling the item out of the bag, ask them to describe the item and what it is used for. Follow on by doing the same with each bag. Depending on the story and how you want to go about it, you could tell each part of the story as you pull out each item or pull out all items and see if the children can guess what the story is all about. If you are really artistic draw out the story you’re sharing or have the children take turns helping you draw a picture to illustrate the story. You will need a flipchart, large whiteboard or some lining paper up on the wall. Identify the key parts of the story and in preparation divide up the space you have allocated for each part of the story. Creation (Genesis) - create 7 spaces, one for each day, and for ‘Day 1’ ask one or more children to depict the earth, space, time & light. And so on for each day. Most Bible stories can be presented as a series of emotions, how they felt, the mood the characters were in, etc. Pick out those key emotions and use them to tell the story. Ask the children to join in making the emotions come to life through facial expressions, sounds and movement. For example emotions could include: Amazed, annoyed, curious, excited, happy, shocked, surprised, etc. Download one of the great animated Bible stories which can be found on YouTube and across the web. 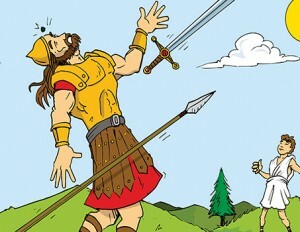 A great website with hundreds of bible story animations is max7.org. Search for the video ‘What is the Bible like? Sword, light, bread’ and use it to get a discussion going with your group. Identify some key words from the Bible story, and before starting to tell the story, ask the children to help you devise either an action or a sound effect for each of the key words. Make sure that as you tell the story you repeat these words and keep the children involved throughout. Pause for a moment each time you use one of the words so that the children can do the action or sound effect. Jesus calms the storm – Ask the children for sound effects and actions for rain, wind and waves. As you tell the story and described what the rain, wind and waves were doing the children carry out the action/sound. Gather clothing and props which could be used to re-create some of the characters in the Bible story. Ask for volunteers to use these items and follow your instructions in a bit of role-play. Go online and find images that depict key parts of your Bible story and put these up around your meeting space. Tell the story by asking the group to follow you around to each picture, tell the part of the story the picture represents, and then move on to the next one. You could also put them up randomly around your meeting space to keep the children on their toes and guessing as to which one comes next. As you read through a Bible story, imagine what it would have been like to be there. What would you have heard? Seen? Perhaps tasted or smelled? Get creative and recreate those experiences for your group. Jonah and the Whale (Jonah 2) – Create a box with a picture of a whale on the side and hole at the back of it, put some slimy noodles (or other appropriate item) inside and ask for volunteers to put our hands inside, to really get the idea of how disgusting it must have been for Jonah to be inside the whale. Feeding the 5000 (Matthew 14) – Have some bread and fish to share out and taste (check for allergies when food is involved). Choose a Bible story and pick out some objects that can be sculpted using Playdoh or other modelling material. Read out the story and ask the children to have a go at modelling the objects, put each of the objects on display for all to see. Once all objects have been modelled, recap the story using the objects as the lead.